Brooklynites know and love Janna Kennedy Hyten, the Halloween Queen of Clinton Hill. For over 20 years, she hosted a spooky bash known as Halloween 313 right outside her historic townhouse. Sadly, the performance has come to an end and Kennedy Hyten has gone ahead and listed her home –a duplex on the lower floors–for sale. 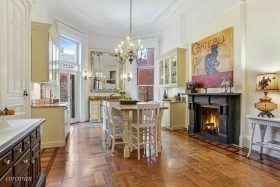 The gorgeous spread, with tons of historic details intact, is asking $2.65 million.